Fashion Revolution Week: How ethical is my wardrobe? This week marks 4 years since the Rana Plaza Disaster, possibly the most powerful example of how much our society values convenience and a bargain over anything else. It was the day on which 1,138 garment factory workers died due to a building collapse, despite the fact that companies were warned to evacuate the premises. Of course, that would have meant losing profit. And there is nothing to fast fashion businesses more important than profit, not the lives of the people that make their clothes and not the environment that their harmful practices are killing. Which is exactly why Fashion Revolution Week is so needed. It’s a time for us to all come together and demand transparency within the fashion industry, by asking brands ‘who made my clothes’? That means no more confusing labels, fake activism or supply chains that are impossible to track down. All we’re asking for is some honesty so that we know whether anybody has suffered for the clothes that we buy. As I’ve said before, the truth is that as a consumer your power is in your money. The cash that you spend is almost like a vote for the ethics that you want to be promoted in our society. So if clothing brands refuse to take responsibility, then you have to. For me, the first step was educating myself, mainly through the documentary The True Cost which you can find on Netflix. 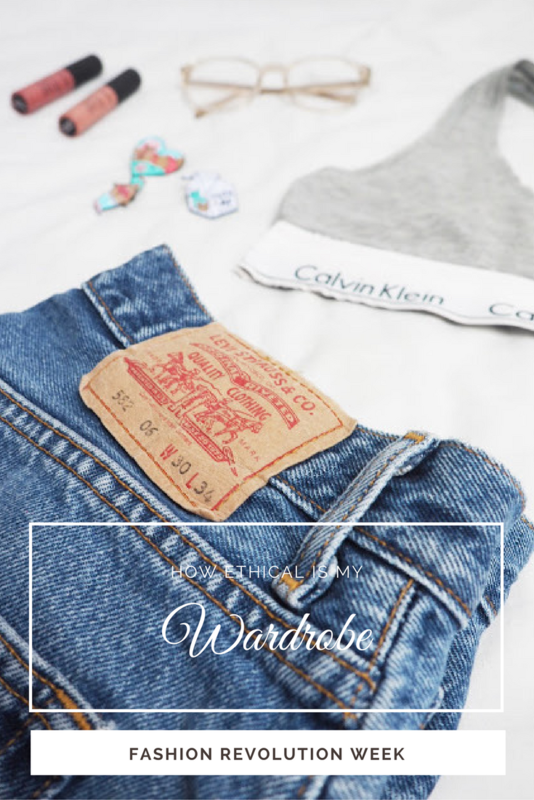 Then, after a few weeks of ignoring the problem, I felt like it was time to face up to my convenience-based habits and find out just how unethical my own wardrobe is. I had a suspicion that the results would be pretty bad and I was correct. To work it out I used the Fashion Transparency Index, which ranks how open brands are about their supply chains working on the assumption that if they’re shady, they probably have a reason to be. Bellow I’ve listed every single brand that’s in my wardrobe and whether or not it’s something I can be proud of. Charity Shop finds: I have a fair few charity shop beauties in my wardrobe including an oversized denim shirt that I’ve had since I was 14, a pair of high waisted Levi’s that I got for £7 and the most adorable white cropped top you ever did see. As a student, buying from charity shops is the easiest option for me. They mean cheap clothes without having to worry about funding fast fashion. Re-vamped pieces: Although the origins of these clothes are by no means perfect, the fact that I’ve attacked them with fabric scissors and made something new means that I haven’t bought something new instead. Pull and Bear and Zara are the two brands in my wardrobe that were ranked above 76% in the index meaning that “The company is making significant efforts in the given areas, and has made some or most of this information publicly available.” So, whilst the brands aren’t entirely transparent, they’re definitely the best of a bad bunch. Jack Will also claim to take responsibility for ethical trading but is not featured on the Transparency Index. All of the brands listed here were either defined as falling below the standards I described above or I have found from my own research that they do not use ethical trading practices. Sadly, but unsurprisingly, this is the biggest category in my wardrobe. Growing up in a country that is covered in Primark, H&M and Topshop stores and years of not stopping to think about where my clothes really came from has clearly taken its toll. The truth is that finding out the ethics of a brand can be a real ball-ache unless they are actively promoting the fact that their supply chain is fair trade. Which is why I’ve decided to just completely avoid the high street altogether. After this wake-up call it’s safe to say that from now on it’s just me, my charity shops and the companies that are revolutionizing the way that we consume.